To the frustration of many Mt. 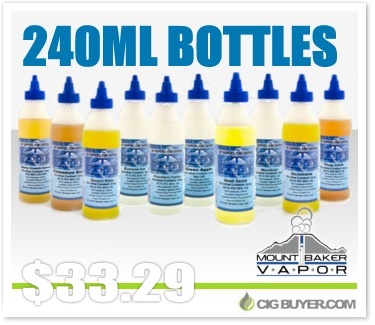 Baker Vapor customers, last year the company decided to quit offering large 240ml bottles of e-juice. We’re pretty sure you can thank the newly imposed FDA vaping regulations for their decision to quit offering bigger bottles, but for a limit-time MBV’s 240ml e-liquid bottles are back! They’re available in 10 of their most popular flavors: Berry Crunch Cereal, Cinnamon Roll, Desert Rain, Extreme Ice, Frostberry Fusion, Green Apple, Menthol, Hawk Sauce, Strawbana and Thug Juice.